We’ve taught you before about the importance of optimizing your blog posts for SEO in order to make your content shareable. But beyond tags and keywords, there are ways you can structure your blog posts in order to generate traffic and shares. This perfect blog post blueprint from Business2Community shows you how to structure your posts for success. Follow this blog post blueprint to outline your content ideas and ensure you’re prepared to include the most important features when you publish them. We may be biased, so we certainly agree that social sharing buttons are key. Recommending related posts at the bottom of your post and including a comments plugin like Livefyre are also quite important. One tip I’d add is to include a call to action to subscribe to your posts, either by email or RSS. However, the infographic creator may have left that out as you can include that in your sidebar and not below each post. These were my favorite blogging tips and takeaways from the infographic. 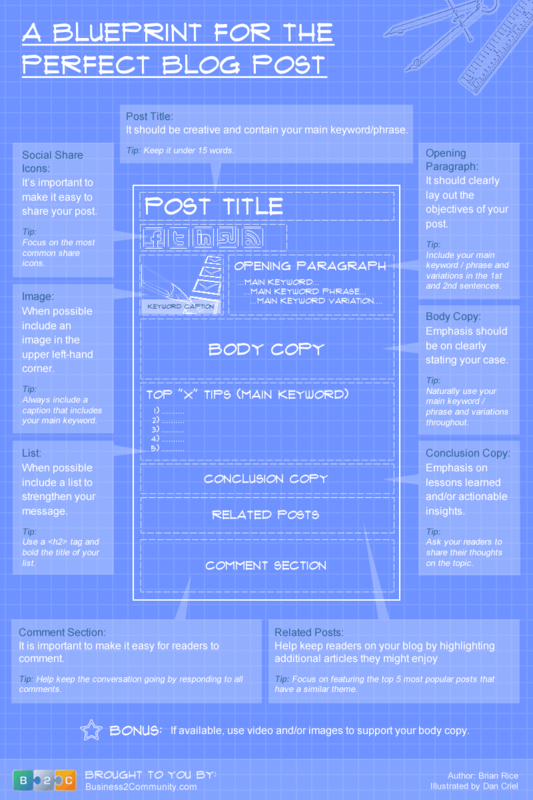 The blog post headline is one of the most important parts of your post. It’s what potential readers see as a preview to your content when it’s shared on social media, and it plays a huge part in their decision of whether to click that link or not. So make it count. 2. Body copy and opening paragraph: State your purpose and objectives. Include keywords and variations of those phrases. There’s so much content for your readers to consume these days. If you want them to share your content, you’ve got to have a hook to keep their attention so they read your piece and pass it along – versus quickly closing the page and moving on to the next intriguing link in their newsfeeds. Stating your purpose is a great way to hook them because it’s setting the value proposition right in the beginning. Answer these questions: What will your readers learn from your post? Why are you talking about the trend, research, or tools that you are talking about? Breaking up your content into a list format makes it easy for your audience to digest. It shows off the teachings of your post in a simpler way than long paragraphs. Bold text, headings, H2 text and bullet points also serve this purpose. Give it a try. What blogging tips did you glean from the infographic? Let us know in the comments! Want daily blogging tips like these? Subscribe to Shareaholic’s blog.